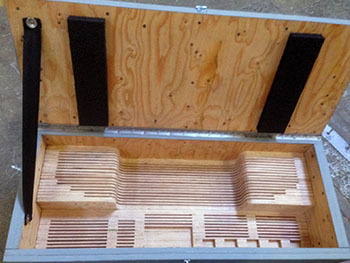 While building wooden crates is a pretty straight forward concept, Crate Tech prides itself on building crates that fit our customer’s need. This includes onetime use, fully enclosed crates, light weight skeleton crates, or even furniture quality trade show crates. Nothing is outside of our realm of ability. Our pallets are also completely custom built, and can be anywhere from a onetime use to elaborately built show pieces that have blocking and bracing placed strategically, allowing the item it’s built for to be gently placed and secured easily and efficiently. Our salesmen are more than happy to come to your location and go over the various options that are available for your needs, and help you decide which route is best for you. We are proud to explain some of our unique ideas that have saved our clients time, money, and their sanity. We are able to install them on your crate in any place that would best suit your needs. Some example ideas are hinged access doors, removable panels, and Plexiglas view ports. They can be hinged or removed entirely or can even be fixed in place and be made of Plexiglas to act as a view port. Installing easily removable doors is a perfect option if you need you or your customer to be able to access the interior without the use of tools. Installing a door can also go a long way towards maintaining the longevity of the crate. Doors can be hinged or completely removable depending on your needs. Give us a call and we’ll help you figure out what’s right for your situation. If access to tools is limited and you need your product to be easily removable from the crate, dividers can be a great option. They can protect your product and are removable without the use of tools. 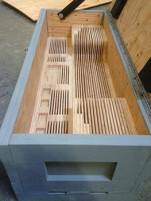 Instantly eliminate the need for handling equipment by having casters installed on the bottom of your crate. We stock a variety of sizes and configurations to make moving your crate around as easy as possible. It is optimal to crate thin, fragile items such as TVs and glass on edge so that they’re upright. 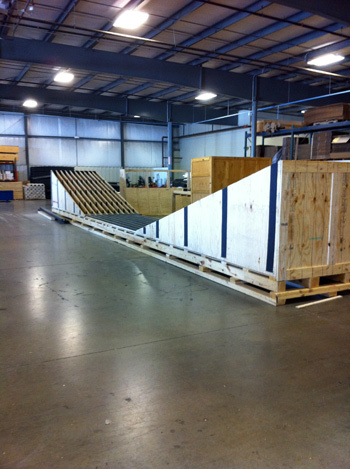 While the A-frame design will assist with stability and keeping your product upright, packing such items on edge prevents your crate from being stacked on during transit, reducing the risk of damage to your product. 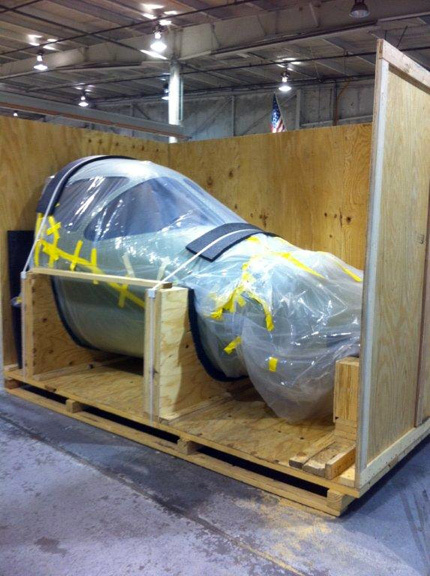 When straps are the best option to secure your product inside its crate, we can provide strategically placed D-Rings to ensure your product will not shift during transit. For a crate that needs to last, and that will be put to the test, Aluminum Gussets can add years to the lifespan. We install them over the corners and cleat joints of the exterior, both reinforcing the connection points, and protecting the crate from forklift damage.